March Open Day – last chance to see? Our Last Ever Open Day? With Moseley Road Baths due to close in June 2017, the next open day on Saturday 18th March could well our last event at the baths for the foreseeable future. Come along between 10am and 2pm for tours of parts of the building that are usually closed to the public and, more importantly, to find out how you can help us in our campaign to keep our pool open! Can you spare a few hours to help out during our open day? If so let us know by emailing contact@friendsofmrb.co.uk. The Moseley Road Baths Action Group is working hard to find a way to keep our pool open, liaising with Birmingham City Council as part of a coalition led by the National Trust, and including Historic England and World Monuments Fund. In order to show that there is demand for swimming and that the pool can continue to operate outside city council control, they need your input. Please take a few moments to fill in the survey below and help us to keep swimming at Moseley Road Baths. 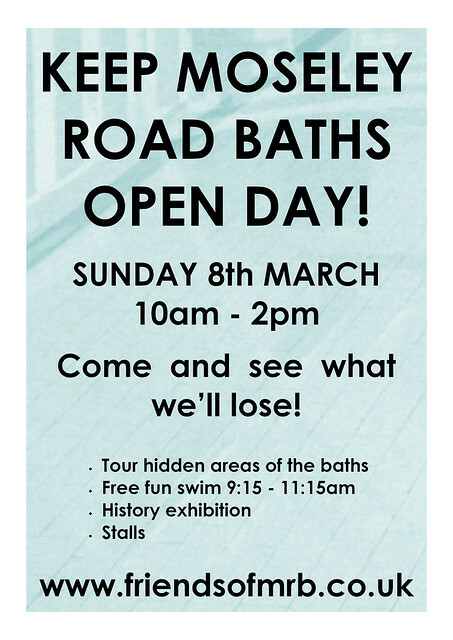 The Friends of Moseley Road Baths are hosting a ‘Keep Moseley Road Baths Open Day’ on 8th March, 10am-2pm, to mark the 108th Anniversary of the building opening its doors to swimmers. We hope to demonstrate just how wonderful and relevant the building is, in spite of Birmingham City Council’s plans to close the facility in 2016. Whilst the building itself opened on 30th October 1907 for washing and laundry facilities, swimming pools at the time were only used in warmer months, so it wasn’t until Spring 1908 that swimmers were able to take the plunge. During winters, pools were usually emptied and boarded over for social activities, including dances, billiards and card games. Moseley Road Baths was also used as a Casualty station during the Blitz. On the day there will be an opportunity to take a tour of areas of the building which are normally closed to the public – previous tours have been really well received and we encourage visitors to take lots of photos! With the building due to close its doors for the last time next year, this may be one of the last opportunities for the public to see areas such as the Gala Pool, Laundry Room, Boiler House and original Water Tank. As well as members of the Friends of Moseley Road Baths, we are also pleased to welcome former employee John Berrill who will be on hand in the plant room to answer questions. Swimmers of all ages can head into the water for a free fun swim on us, with floats and toys in the pool between 9:15am and 11:15am. This will be on a first come, first served basis, so arrive in good time! Members of the Friends of Moseley Road Baths will have a stall where postcards and our book will be available to buy, and visitors can learn more about our campaign. 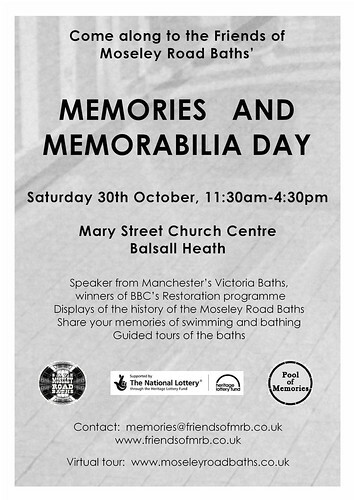 Memories and Memorabilia Day 2010 is almost upon us and will this year be held on Saturday, October 30th (the 103rd birthday of Moseley Road Baths) at the Mary Street Church Centre, corner of Edward Road/Mary Street, Balsall Heath (around 400 yards from the baths). The event runs from 11:30am-4:30pm. This year’s Memories and Memorabilia Day forms an important element of Pool of Memories, the three-year history project for which we have received a Heritage Lottery Fund Your Heritage grant. An exhibition showing a selection of the photos, video film, reminiscences and artefacts already collected by the Friends of Moseley Road Baths as part of the Pool of Memories project will be on display and we’re really keen for those amongst you who swam, washed, worked, dived or danced at the baths to add your own memories (and memorabilia) to our growing archive by recounting and possibly recording your stories to our oral history volunteers who will be on hand for just this purpose. Following last year’s superb illustrated talk by Played in Britain series editor Simon Inglis’ on Britain’s historic indoor swimming pools, we are delighted to welcome Neil Bonner from the Victoria Baths Trust in Manchester who will tell (and show) us all about the past, present and future of these glorious Grade II* baths (winners of the BBC’s inaugural Restoration series in 2003)! Neil’s presentation is scheduled for 2:15pm. 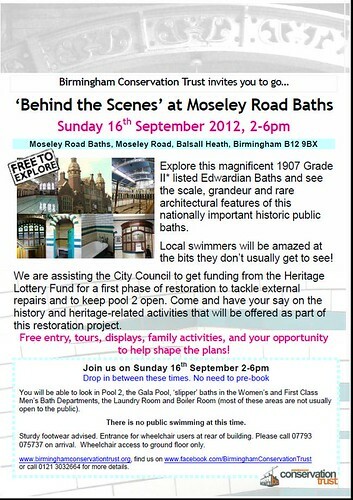 As in previous years, we’ll be providing guided tours of Moseley Road Baths, including the Gala Pool and ‘slipper’ baths. There will be three tours (Noon; 1:00pm and 3:30pm), and we’ve been asked by the Council to limit the number of places per tour to 20, so advance booking is advised. Tours start from the Church (why this is will become clear on the day) and will last just over 1 hour. Please note that the tours take in areas of the Baths where there are steep steps and uneven surfaces. Places will be allocated on a first come, first serve basis. To book please e-mail us at memories@friendsofmrb.co.uk marking your e-mail ‘Baths Tour’ and stating which tour you would like to go on. Admittance to Memories and Memorabilia Day is free and refreshments will be available, although donations to the Friends of Moseley Road Baths group are most welcome. Car parking is available at the church centre (Mary Street entrance). Well, we celebrated the 102nd Anniversary of the opening of Moseley Road Baths on Saturday in real style! Our ‘Memories and Memorabilia Day’ on Saturday 31st October was a resounding success, with a packed hall and tours and wonderful feedback from all who attended. Steve Beauchampé who has been a member of the group from the beginning and is the co-author of ‘Played in Birmingham’, which charts the heritage of Birmingham at play, led two tours of the building. The tours took the public into areas that have been unopen for many years. Apologies for all those who were unable to make the tour, we really were pushing the limits of how many people we could get in! If you didn’t get round to putting your name down for future tours then please drop us a line at contact@friendofmrb.co.uk to be added to the list. Simon Inglis’ talk on the history of swimming in Britain and Moseley Road Baths’ important place in this was standing room only. He has some marvellous photos of historic pools, including images of a floating greenhouse on the Thames! If you liked what you heard then there are several books in the ‘Played in Britain’ series which document Britain at play, including ‘Great Lengths’ featuring Moseley Road Baths, which are available from our group or online at www.playedinbritain.co.uk. 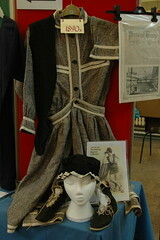 Joan Gurney brought along her impressive selection of historic swimming costumes to display. Whilst the days of knitting your own swimming costume are thankfully behind us, there were some really gorgeous and fashionable outfits. Perhaps wearing shoes to swim won’t catch on again, but many of the costumes made your average set of speedos look rather dull! Thanks should also go to the groups who put on stalls and some really good displays. Mentions here for the Victorian Society, Friends of Sparkhill Baths and Balsall Heath Local History Society who were showcasing their ‘Tales Out of School’ project. To learn more about the day and our campaign, Andrew Brightwell and other students on an MA Online Journalism course documented the day and have put a selection of articles and films up on the HashBrum website, including some videos of yours truly getting rather excitable talking about the possibilities of the building! 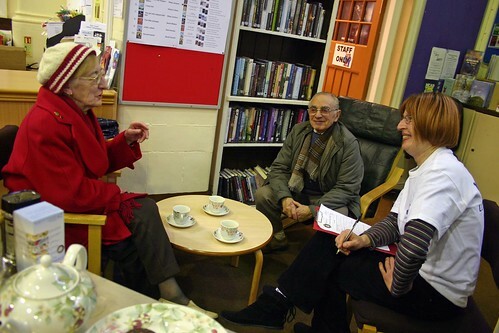 I was also on hand to conduct filmed interviews with members of the public who wanted to share their memories. Gordon Whittle brought along some fantastic photos from Woodcock Street Baths and shared his memories of working at Moseley Road Baths from 1970 onwards. However, it was May Allen who trumped everyone to the earliest memory of the pools by a couple of decades; she recalls swimming there in 1938! If you missed out on the opportunity to share your memories with us then please contact us to request a form to share your memories. We will strive to put a downloadable form on here shortly, but in the meantime please e-mail us at contact@friendofmrb.co.uk in order for us to send the form out to you. We really value all contributions, even if it is currently taking us a while to process them. Hopefully our funding application to the Heritage Lottery Fund will be successful, enabling us to do more than simply scratch the surface of these amazing memories! Friends of Moseley Road Baths are very pleased to welcome Joan and Gerald Gurney to our ‘Memories and Memorabilia Day’. They have travelled from Essex with just a sample of 48 costumes from an even larger collection of swimwear and accessories that Joan has been collecting since the 1950’s. Some of the costumes date back to the Edwardian era – so come and see how the first swimmers in our pool may have been dressed when they went for a dip! Joan is a swimming historian who will be on hand on the day to answer questions and show you her exhibits. We would also encourage you to search around at home and bring old costumes of your own, however embarrassing! 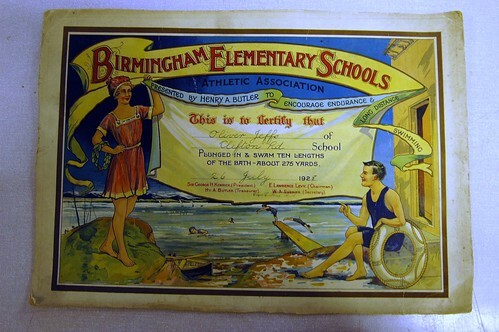 We are starting our own collection of swimming costumes, accessories, certificates, badges – in fact anything to do with swimming – as part of our oral history project. Come on the 31st October to the Memories and Memorabilia Day to share your memories! The excitement is building up to our Memories and Memorabilia Event on Saturday. Cakes are being baked, displays being finalised, videos being edited and posters and postcards are flying out of our hands! We’re also eager to hear from anyone who wants to share their memories, so if you want to be interviewed drop us a line at contact@friendsofmrb.co.uk. Likewise, if you want to bake a cake or have an unusual costume you can dig out to show us then let us know!